US Secretary of State John Kerry said that Moscow and Washington are working on a possible agreement on Syria, including the issue of Aleppo. Kerry and Russian Foreign Minister Sergey Lavrov held talks in the German city of Hamburg on the sidelines of an OSCE meeting. The meeting lasted about 10 to 15 minutes, according to media reports. Kerry added that he was “hopeful” about a potential breakthrough, RT correspondent Peter Oliver reports from Hamburg. 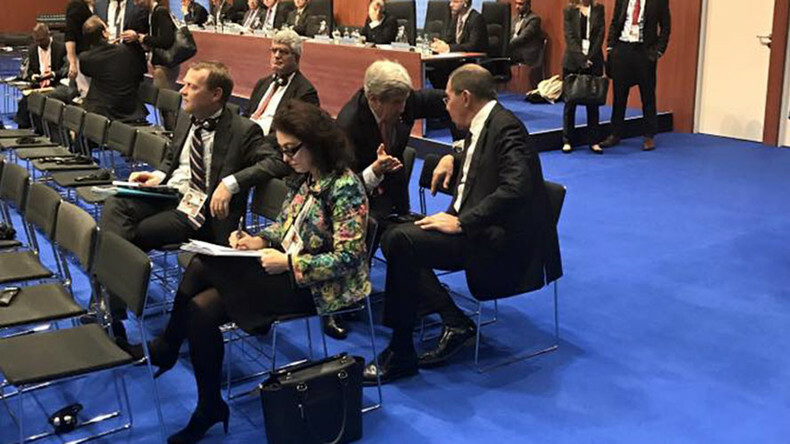 This is Lavrov and Kerry’s second meeting in Hamburg. On Wednesday, following initial talks, Kerry told journalists that the two sides exchanged their ideas regarding the situation in Aleppo and agreed to continue the discussions on Thursday. However, two days later, Washington abruptly withdrew the proposal. “They have withdrawn their document and have a new one. Our initial impression is that this new document backtracks, and is an attempt to buy time for the militants, allow them to catch their breath and resupply,” the Russian foreign minister said on Tuesday. The latest news of a possible agreement comes a day after the Syrian Army liberated 15 more eastern Aleppo neighborhoods and evacuated 1,200 residents from the city, according to the Russian Reconciliation Center in Syria. The Syrian authorities currently “fully control 50 neighborhoods in the eastern part of [Aleppo],” amounting to “70 percent of the territory that was initially controlled by the militants,” said a statement from the Reconciliation Center on Wednesday. On Wednesday, RT’s Lizzie Phelan and her crew were the first journalists to visit the part of Aleppo’s Old City recently recaptured by Syrian government forces.